Grace College alumnus Robert Spahr (class of 1964) has sent along a couple of historic photos of Winona Lake, Indiana, as the town looked about 50 years ago. McKee Courts, shown here, was a motel located in the center of the island, which served as a men’s dorm. Those who lived there will remember the huge ruts and potholes in the driveway, as well as the moisture and mold problems in the motel itself, especially during the winter. 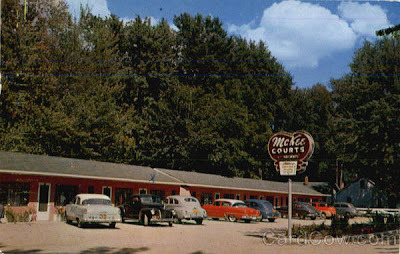 McKee Courts was razed a number of years ago, and the area is now just a grassy field. In the early 60s, Grace College men lived at McKee, women lived at the Westminster, and all students ate their meals in the dining room of the Westminster Hotel. Alpha Hall, which became the women’s dorm and dining area, was built and occupied in 1964. My kids used to love to trick or treat at McKee Courts. The students gave out good candy. Our house was just across the alley on the south. I remember fondly living in McKee Courts during my freshman year in 1961. One thing for sure, anything you threw on the wall only went to improve the room. During the coldest time of the year, while the guys in the next room went home for the weekend, some unnamed fellows opened their bathroom window, put a big carp in their toilet, the water froze and that thing stayed froze for the next two months. Yes, that was a time of great maturity and when I think about it, I still laugh.